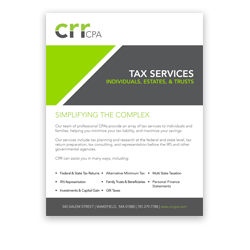 Our team of professional CPAs provide an array of tax services to individuals and families, helping you minimize your tax liability, and maximize your savings. Our serivces include tax planning and research at the federal and state level, tax return preparation, tax consulting, and representation before the IRS and other governmental agencies. Check out our most recent Tax blog posts!